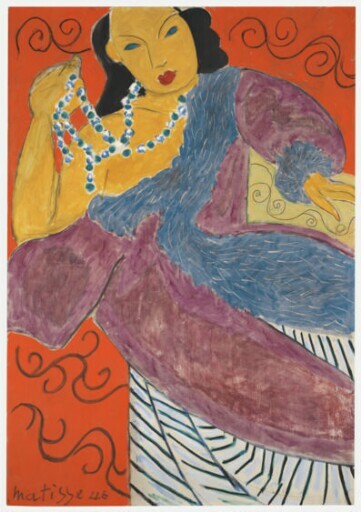 Coming nearly at the end of Matisse’s long career, L’Asie culminates his obsession with painting the female figure in rich, exotic costumes and settings. In the work’s title he was perhaps alluding to a well-established tradition in European art in which female figures were used to symbolize each of the continents. Or it may have been suggested by one of his favorite costumes, a Chinese coat lined with white fur from a Siberian tiger, here rendered in violet and blue and worn over a haute-couture striped gown. While the golden ocher skin tones of the model are characteristic of Asian peoples, the model apparently came from the Congo. Moreover, her eyes are blue and green, as if reflecting the colored beads of her necklace. Traces of an earlier state of the picture, which Matisse signed and dated 1946, were uncovered during an infrared examination. This state corresponds to a black-and-white photograph of L’Asie published in Alfred Barr’s 1951 book, Matisse: His Art and His Public. The photograph shows L’Asie with a black quadrant in the lower left, enlivened by arabesque lines, and a signature and date that were scratched into the paint revealing the brilliant white ground. In L’Asie’s finished state, Matisse converted this area to a flaming red, thereby unifying the background as a decorative space, and redrew the arabesque lines as well as his signature and the date with black crayon. This revision is first recorded in the October 1948 issue of Verve devoted to the artist’s paintings in Vence.The artist probably revised L’Asie several times before bringing the painting to its brilliant conclusion. Matisse’s studied and meticulous working methods often included erasing earlier passages to maintain the spontaneous appearance of his paint surface. This version has particular significance due to the fact that is was signed and dated, as well as photographed. The nature of Matisse’s revisions in L’Asie may reflect his new fascination with cutouts, beginning in 1943, to which the artist would devote his energies in his last years, while also anticipating the radiant red Vence interiors of his last great series of paintings. purchased through (Acquavella Galleries, Inc., New York) by Kimbell Art Foundation, Fort Worth, 1993.